Old is the NEW Awesome. Mainstream may have just gotten the memo. 2013 is having a senior moment. "Grampa style" is in, (just ask Macklemore) and recently, a number of women "of a certain age" are being celebrated for bold style and actively influencing the wardrobes of youngsters, an unusual direction of fashion influence, seldom before seen in the fashion world. See Iris Apfel, see Linda Rodin, Tziporah Salomon, Madonna, Helen Mirren, etc, etc. One of the earliest chroniclers of this new "old" moment is an intrepid and mild mannered 30 something, Ari Seth Cohen. (You can read my 2012 interview of him here.) While others were chasing the fleeting fashion moments of a much younger crowd, Ari was quietly setting up shots of the often over-looked but snappily dressed "silver haired set." He showcased his images of "Advanced Style" presenting a color range of +50 year old ladies and gentlemen. And we seemed to have collectively sat up and taken notice. Now there are ad campaigns featuring many of Ari's subjects and a few documentaries in the works (see Fabulous Fashionistas) including one of the Advanced Style ladies by Cohen and his film collaborator, Lina Plioplyte, scheduled to hit the film festival circuits any moment now. In fact I wonder what's next for Ari and his Advanced Style ladies, now that there's a coffee table and Coloring Book already in his pocket, and the documentary film in the works. And I wonder: what's next for us? Is this fabulous watershed of including and showcasing wonderful women (and men) over the age of 50, as sartorially inspiring and culturally relevant, a societal tipping point, or just a flash-in-the-pan? Are these silver style foxes here to stay in our collective consciousness or just a fashion fad? For me, it was such breath of fresh air, to see an all-ages style hit the air waves, and to discover women bravely and brazenly putting themselves out there, style-wise. I think it adds depth and dimension to contemporary fashion, seeing its evolution begin to include what was formerly invisible and shoved to its sidelines. Here's hoping Advanced Style and its like are here to stay. May 2014 have many "senior" moments as well. 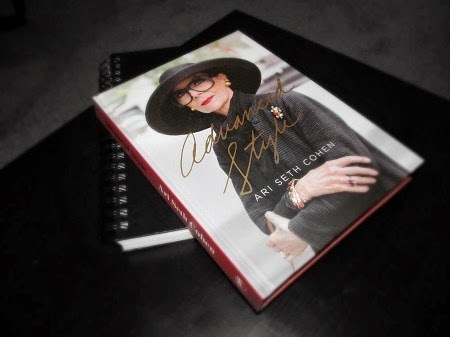 BOOK GIVE-AWAY: I have a signed copy of the Advanced Style book to give-away to one lucky advanced style lover! The give-away is open to everybody (including international friends) who love Ari and his Advanced Style ladies as much as I do. To qualify, you must be a reader of this blog, and we request you leave a comment on this post- sharing YOUR Advanced Style inspirations. Winner gets announced Janurary 6, 2014. Update: PLEASE ENTER YOUR INFO IN THE RAFFLECOPTER WIDGET. THAT'S HOW THE WINNER WILL BE CHOSEN. THANKS! Oh, Bella, great post. I strongly believe this is not a flash in the pan - demographics if nothing else will keep fueling this great ride as boomers roar into their 50+ years with attitudes that refuse to shift into neutrals. It's only the beginning. What an excellent giveaway. Count me in! Isn't it fun to see so many fabulous women getting much deserved attention. Together so many of us are changing the definition of the traditional "elderly woman!" It is such fun...and I always love to see what you are up to. Have a Happy New Year and I am looking forward to see what 2014 will bring! I loved this post and - as a mere 66 year old! 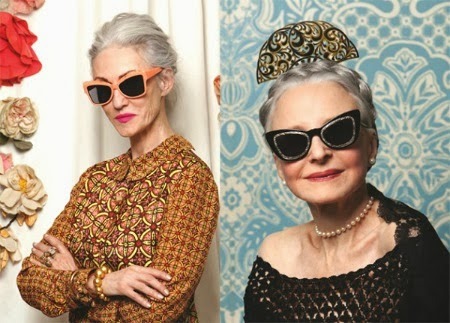 - I love to see these over 80s rocking their looks. They are so inspirational for us younger women! Please count me in for your excellent giveaway. Happy New Year, Bella! Style has no age-limit. Then again, I never thought I'd be old, either! Good post. Love it! No limits, and I agree with Melanie - this is only the beginning! Please include me in the draw, thank you! Fantastic post, Bella. I think this is the beginning of something and not a fashion fad - and we have Ari to thank for that. Happy New Year! I would so enjoy that book ..
Count me in! I contributed to Ari's Kickstarter for the film (am I getting a copy as a reward? Can't remember. #soold). Would love a copy of the book. 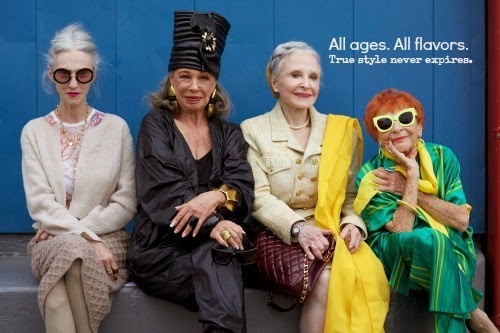 My OG Advanced style muses must first be the elder women of my extended family, three especially. Great Aunt Carol wore scads of charm bracelets that I would closely examine whenever we visited. I now have one of them. I also wore her wedding dress (which was her great grandmother's from 1860!). Grandmother Parmalee, my paternal grandmother, was kind of scary. I remember her bun. (I wore my hair in a bun for 35 years or so). She passed away when I was six, I think. Cousin Anita was Chinese (very exotic for upstate NY in the 1950s). She sort of had the same vibe as Grandmother Parmalee, but was nicer and had amazing style. Then, there is the muse for my oversized glasses: Carrie Donovan. Happy 2014! I'm wearing the Bella scarf today! Giving credit where credit is due!! I'd include you, as you have championed the over-40 style bloggers for a long time. I agree with Melanie that demographics alone will ensure that we keep being seen, at least for a while. (As long as we have money to spend, no doubt.) As for me, I can't get enough. I'd like to see more and more, with much more diversity. Fantastic giveaway, Bella - I've been meaning to buy this book so winning a signed copy would be fabulous! I think the response to all the amazing ladies that Ari features has been so positive that they definitely are NOT a flash in the pan. I personally find them so inspiring that I have no qualms about my style as I get older - more years means more freedom which is wonderful!!! I have followed Advanced Style for a while and I love the pure courage of these women! 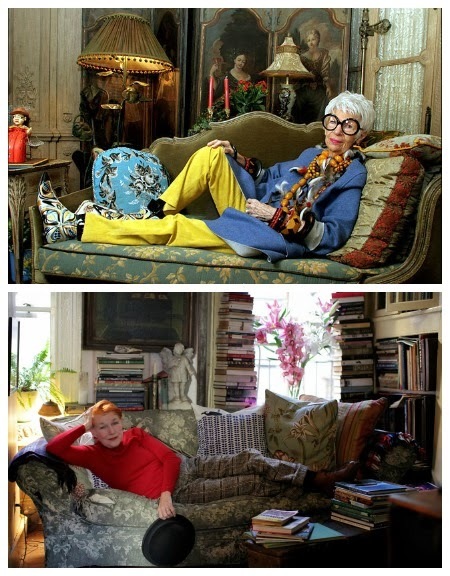 their love of fashion is so clear and they wear whatever they want - I want to be half as brave as them when I am older! Yes, a breath of fresh air, to be sure! I adore all these pics, and it's nice to see Ari too. Thanks for this, Bella! Given that there are a whole bunch of us who are over 40 and 50 heading into our "Silver-haired" years, I'm thinking this is just the tip of the iceberg. 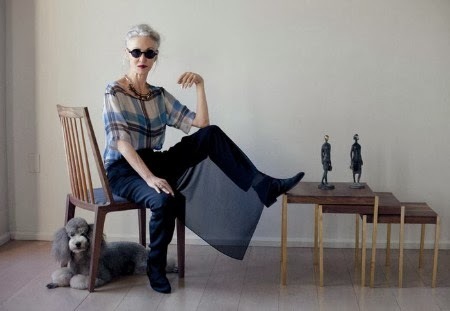 Ari has had foresight to start documenting the women who are already in their 70's and 80's who are showing us that old age doesn't have to be terrible, if you have your health, a sense of humour, and a fearless sense of style. Unfortunately, it won't be everyone's old age, but it gives us visible options that weren't seen before. They're paving the way - for us! We're going to be even more fabulous than they are (if you can even imagine that!). I discovered Advanced Style sophomore year (now a senior in high school) by a friend introducing me to the blog. She knew I'd love it because I too fond of "elderly folks". I checked out the blog and in that instant I wanted to paint my nails black. I wanted to have fun. These beautiful gals taught me that it's okay to have fun even through the aging process. You can look good any time, any age. Not too long ago I was volunteering at one of my favorite local shops gift wrap. As I'm fixing up the shop this beautiful lady walks in. She was so "Advance Style" I couldn't help but tell her how rad she looked. I asked her about what she was wearing; her rings, necklaces, hair, etc. At the end I ended up telling her about Advance Style that she should check it out. When she left the shop I told myself I'm going to start having fun. I'm going to dig through my dads closet and I did! I stole his army jacket! I had seen Ari on television and thought how wonderful for the women of advanced style. I thought when I get older, I can dress just like them. Older in how much older is my question to me the other day. Then, I realized that I'm in a comfort zone that needs to be exploded open and that is what I'm doing. I'm not happy with my wardrobe at all. I do have some bold clothes and need more. I'm making that move and the women of advanced style have opened this door for me. My style is Western meets Elegance meets Artsy. I like all of the above and can intermingle them in my clothes. I have similar taste as Designer Suzi Click and have even purchased a pair of her jeans just yesterday. I'm in this for the long haul and even blogging at growingbolder.com to keep me on track. Yeah to Advance Style. I never did understand the notion that I was supposed to not look stylish/fashionable/put together just because a had birthday. I wonder what happens to the people that still believe that when they turn 40/50/60? Hi Bella! Wanted to wish you a happy new year honey! I hope 2014 sees your business taking off Bigtime! I think everything is a flash in the pan, this fad of the old being seen will fade like everything, we will still be here but the media will have moved on. Who cares though as long as we just keep being true to who we are until the very end! Love these ladies. I was so moved by the Fabulous Fashionistas. I laughed and I cried. PS Happy New Year dear. oh dear, Advanced Style is a neverending source of inspiration and attitude!, love Debra's hats, love Tziporah's great style, love Lynn's bracelets and love Ilona's eyelashes! and love that you're sharing it! What a wonderfully well done post my dear! And about a topic I am passionate about ... because changing our cultures idea of aging ... helps each and everyone of us ... as each and everyone of us will, if we are so lucky ... age... I have held these convictions since I was in high school ... which was a long, long time ago! It was actually finding Iris Arpel, years ago ... that changed my life ... and made me realize in an instant ... that fashion was not just a possession of the young ... that it belongs to all of us! Thank you gorgeous, for writing on such important issues for us all! Wishing you all the very best this coming year! Please enter me in the contest. Iris Arpel is one of my favorites, she sells her jewelry and accessories on HSN.com. I *love* style profiles of silver ladies like this. Not only do they give me hope for my own decades to come, but they are so intrinsically confident, graceful, and striking in themselves. *Why* is it that our culture finds it so easy to see and acknowledge the hotness and dashing style of 50+ men, but is so reluctant -- perhaps even unable -- to see these qualities in women of the very same ages? It would be interesting to do some sort of psych experiment. Showing people hundreds of photos of 50+ people of both genders, having them score attributes like physical attractiveness, perceived confidence, physical health, sexual activity, etc., and seeing which gender rates higher for various ages. Oh...and my 40+ inspirations? On a celebrity level, I watch Cate Blanchett and Tilda Swinton. They're so graceful and mysterious, yet so...quirky sometimes. They both have a good eye for simple elegance and drama. On a daily, more realistic level, I like to look at the 40-something moms around me who've managed to "keep themselves up" despite family+work busyness and typical Midwestern household budgets. I don't look at the ones who manage *everything* somehow -- perfect highlights, mani/pedis, spotless chic homes, expensive bags, trim bums in designer jeans...but I look at the ones who've chosen a few targets and do them well and consistently. Mil besos dear Bella, and thank you soooooooooooooo much for your helpful feedback on Share-in-Style, now monthly. I'm in!!!!!! I want this book! Beautiful post Bella. I think we are here to stay, visible and not a fad. As always, you lead the discussion. Ari has started a revolution, and we are all benefiting from his brilliance. My comment is rather late (sorry) but I still like to add it. What I find so nice about those ladies is that they give me a bright future. A future with fun and excitement as far as fashion is concerned and adorning yourself. No ending in sight. Yeah.